Michael Gordon "Mike" Score (born 5 November 1957) is an English musician. 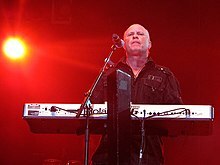 He is best known as the keyboardist, guitarist and lead singer of the new wave band, A Flock of Seagulls. He released a solo album on 1 March 2014 titled Zeebratta. Born in Beverley, East Riding of Yorkshire, England, Score had previously been a hairdresser, and was well known for his distinctive combed-back hairstyle. By 1982, he grew out his hair making it longer in the back and combed it to the side. Prior to joining A Flock of Seagulls he was in several short lived bands including Tontrix, where he played bass. He was in the band A Flock of Seagulls until 1986, but when he decided to reform the band again in 1989, the other members declined to join him. He performed and toured with A Flock of Seagulls with different members. In 1999, Score recorded a song for the compilation album Trackspotting V, named "All I Wanna Do". It was the eighth track (out of 18) on the album, and he is credited as "Scorey". In 2003, the original members of A Flock of Seagulls were reunited by VH1's Bands Reunited. They played their hit "I Ran (So Far Away)" at a one-off performance in London. In an interview before the performance, it was revealed that his "seagull" or "wings" hairstyle was created when Score was trying to style his hair like that of David Bowie's character, Ziggy Stardust. AFOS bassist Frank Maudsley was trying to use the mirror at the same time, and placed his hand on Score's head, leaving only the hair on the sides of his head sticking up. The reunion of the band apparently resolved tension between himself and his brother, Ali Score, the band's ex-drummer, which had been present since the band's break-up. On 4 February 2013, Score indicated, via his YouTube account, that he had begun to pursue his solo career and on the same day, Score uploaded a music video of his song "All I Wanna Do" (re-recorded, as the original version is on Trackspotting V). It was released as a single on 18 February 2013, on Right Track Records. The track's genre is ambient electronica. Score planned to release a solo album soon after, but in July 2013, the van used by Score and his musicians was stolen from a Comfort Inn in Downey, California. The van contained Score's equipment, clothing, and the hard drives containing the album's tracks. The next day, the van was found with nothing inside. The hard drives containing the audio files have since been recovered. In mid-January 2014, Score released his second single entitled "Somebody Like You". On 1 March 2014, Score released Zeebratta, his first studio album. As of December 2007, Score lives in Brevard County, Florida on the Indian River. He ran a restaurant called The Legends Café in Cocoa Beach, which closed in 2008. ^ Ancestry.com. "England & Wales, Birth Index, 1916-2005". ^ Duke, Alan (24 July 2013). "Flock of Seagulls' van found, but gear's gone". CNN. Retrieved 19 August 2013. "The More You Live, the More You Love"